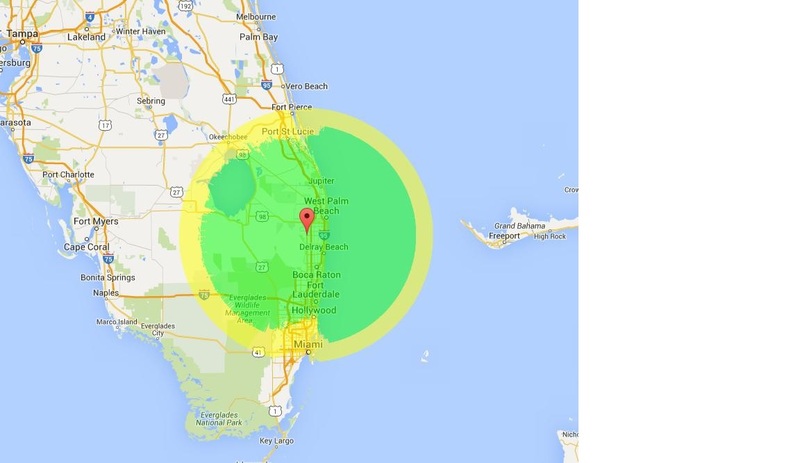 This DMR Repeater covers most of Palm Beach County with a few holes to the northeast. We are correctly working on locating a site for another repeater. We have partnered with a few other repeater owners to provide a Palm Beach Countywide talk group that will provide handheld coverage in all of the coverage area. Contact us for more information on the talk group. This repeater is linked to the international DMR-Marc network and carries many talk groups, but not all of them because there are many other repeaters in the area that have overlapping coverage and they carry all of the other talk groups. We feel that it would be redundant for us to carry them and would also tie up the time slots and make them unavailable for local users. Here is a calculated local coverage map.